You are here: Home | Popular | Kintora Kids rock! Congratulations to all who graded last weekend. You were amazing! Preliminary 2nd kyu grading: Ben Farrell. New brown belts: Max Hohman, Asha Doolabh, Meera Doolabh, Olivia Farrell, Fletcher Hilder and Ethan Toselli. Preliminary 3rd kyu grading: Alexis Hilder. 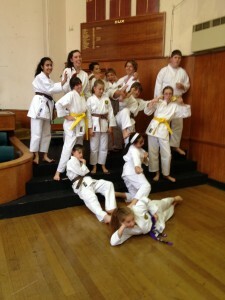 New yellow belts: Anna Hughes, Caitlin Hughes and Julia Hughes. New 9th kyus: Haimish Cooper and Kieran Sainsbury.